This is a list of notable bombings related to the Northern Ireland "Troubles" and their aftermath. It includes bombings that took place in Northern Ireland, the Republic of Ireland and Great Britain since 1969. There were at least 10,000 bomb attacks during the conflict (1969–1998). 5 August The Ulster Volunteer Force (UVF) exploded a large bomb at Radio Telefis Éireann (RTÉ) headquarters in Donnybrook, Dublin causing significant damage to the building. 19 October 1969 - Thomas McDonnell, a member of the UVF was injured & died a few days later when a bomb he was planting exploded prematurely at a power station near Ballyshannon in County Donegal. McDonnell was also a member of the UVF linked Ulster Protestant Volunteers (UPV). 29 October 1969 - The UVF exploded a bomb at the gravestone of Wolfe Tone (the founding father of Irish Republicanism) in Bodenstown, Sallins, County Kildare, Republic of Ireland. The blast occurred at 5.00 am and destroyed a headstone. 26 December 1969 – The UVF planted a bomb at the Daniel O’Connell statue on O’Connell Street. Little damage was done to the statue but the blast smashed windows in a half-mile radius. 28 December 1969 – The UVF detonated a car bomb outside the Garda central detective bureau in Dublin. The nearby telephone exchange headquarters is suspected to have been the target. 16 July: The Provisional IRA (IRA) exploded a bomb at the Northern Bank premises in High Street, Belfast City Center. Over 30 people were injured in the explosion, three of them seriously, plus large damage was caused to the building. 11 August 1970 RUC booby-trap bombing - Two RUC officers were killed outright when they detonated a booby-trap car bomb in Crossmaglen in south County Armagh. They were the first RUC victims of the IRA. 17 January 1971 – Daniel O’Connell's tomb in Glasnevin Cemetery is damaged by a Loyalist bomb. It was thought that members of the UVF were behind the bombing. There were no injuries. 8 February 1971 – The Wolfe Tone statue at St. Stephen's Green is destroyed by a Loyalist bomb. No injuries. 1 September - The IRA exploded a number of bombs across Belfast & Derry injuring about two dozen people. 2 September - The IRA exploded a bomb at the headquarters of the Ulster Unionist Party (UUP) which wrecked the building, a number of people were injured in the blast. 20 September The IRA exploded a bomb in the Bluebell Bar in the Loyalist Sandy Row area injuring 27 people. 29 September Two Protestant civilians were killed when the Four Step Inn on the Shankill Road in Belfast was bombed. No group said they did the bombing but it's believed the Provisional IRA was behind the bombing. 9 October 1971 The UVF exploded a bomb in the Fiddler's House Bar in the Catholic Falls Road area of Belfast. They were hoping to kill a Catholic but instead killed a 45-year Protestant woman Winifred Maxwell. 2 November Red Lion Pub bombing – Three Protestant civilians were killed and dozens injured by an IRA bomb attack on a Protestant bar on the Ormeau Road, Belfast. 4 December McGurk's Bar bombing 15 civilians were killed and 17 injured by an Ulster Volunteer Force (UVF) bomb attack on a Catholic bar in Belfast. 11 December 1971 Balmoral Furniture Company bombing - Three Protestant civilians were killed, two of them children, and one Roman Catholic civilian was also killed. 19 people were injured in the attack. 22 February Aldershot bombing – seven people were killed by an Official IRA bomb at Aldershot Barracks in England. It was thought to be in retaliation for Bloody Sunday. Six of those killed were female ancillary workers and the seventh was a Roman Catholic military chaplain. 4 March – a bomb exploded without warning in the Abercorn restaurant on Castle Lane in Belfast. Two were killed and 130 injured. 23 March – the Provisional Irish Republican Army detonated two large car bombs in Main Street, Bangor, County Down. 14 April – the Provisional IRA detonated 24 bombs in towns and cities across Northern Ireland. There was also 14 shootouts between the IRA and security forces. 21 July – Bloody Friday The IRA exploded 35 bombs across the Northern Ireland, three large car bombs exploded in Derry causing no injuries. The Belfast-Dublin train line was also bombed but the worst was in a small space of time in Belfast – within the space of 75 minutes, the Provisional IRA detonated 22 bombs in Belfast city center. Nine people were killed (including two British soldiers and one Ulster Defence Association member) from two bombs while 130 were injured. 31 July Claudy bombing – nine civilians were killed by a car bomb in Claudy, County Londonderry. No group has since claimed responsibility, although the Provisional IRA is the main suspect. 14 September Imperial Hotel bombing 1972 - The UVF detonated a car bomb outside a hotel near the Antrim Road, Belfast which killed three people & injured 50 others. 91 year old Martha Smilie a Protestant civilian was the oldest person killed during the Troubles. 31 October Benny's Bar bombing - The Ulster Defence Association (UDA) exploded a bomb outside a pub in Belfast killing two Catholic children & injuring 12 people. 1 December – two civilians were killed and 127 injured by two Ulster loyalist car bombs in Dublin, Republic of Ireland (see 1972 and 1973 Dublin bombings). 28 December - Ulster Loyalist paramilitaries exploded a bomb in the town of Belturbet, County Cavan in the Republic of Ireland which killed two teenagers & injured 8 other people, at the same time a bom exploded in Clones, County Monaghan injuring two other people. 8 March One civilian died as a consequence of the bombing of the Old Bailey courthouse in London; over 200 were injured at this, and a simultaneous explosion at the Ministry of Agriculture in Westminster. 5 May A British soldier was killed by a remotely detonated IRA mine at Moybane, near Crossmaglen. 11 May A Royal Ulster Constabulary (RUC) officer, John Kirkpatrick, was seriously injured by a car bomb which detonated as he attempted to start his TVR 1600M outside of 79 Eglantine Avenue in Belfast. 17 May Five British soldiers were killed by a Provisional IRA bomb in Omagh, County Tyrone. 12 June Six Protestant civilians were killed by an IRA bomb in Coleraine, County Londonderry. The warning given prior to the explosion had been inadequate. 10 September King's Cross station and Euston station bombings 13 people were injured when the IRA exploded two bombs at railway stations in London. 18 December 1973 Westminster bombing A car bomb exploded on Thorney Street near Millbank in London injuring 60 people. 4 February M62 coach bombing – 12 people were killed by an IRA bomb planted on a coach carrying British soldiers and their families. 12 February the National Defence College in Latimer, Buckinghamshire was bombed by the IRA, but no fatalities were incurred. 30 March Paramilitaries carried out a major incendiary bomb attack on the main shopping centre in Bangor, County Down. 2 May Six Catholic civilians were killed and 18 injured by a UVF bomb at a bar on the Ormeau Road in Belfast. 17 May Dublin and Monaghan bombings – the UVF exploded four bombs (three in Dublin, one in Monaghan) in the Republic of Ireland. They killed 33 civilians including a pregnant woman. 17 June The Provisional IRA bombed the Houses of Parliament in London, injuring 11 people and causing extensive damage. 17 July - 1974 Tower of London bombing The IRA exploded a bomb at the Tower of London, killing a civilian and injuring 41 people. 5 October Guildford pub bombings – four soldiers and one civilian were killed & 65 people injured by IRA bombs at two pubs in Guildford, England. 22 October - Brook's Club bombing The IRA threw a bomb into a Conservative club in London, injuring three members of staff. 21 November Birmingham pub bombings – 21 civilians were killed & 182 injured by IRA bombs at pubs in Birmingham, England. 25 & 27 November - 1974 London pillar box bombings The IRA exploded several bombs over a two-day period, injuring 40 people in total. 30 November - The IRA threw two bombs at the Talbot Arms pub in Chester Square, Belgravia, London, which injured five people. 17 December - Telephone Exchange bombings The IRA exploded three time bombs in west London at Telephone exchanges, killing one civilian & injuring six others. 18 December - 1974 Bristol bombing The IRA detonated two bombs in Bristol injuring 20 people. 19 December - Oxford Street bombing The IRA exploded a 100 lb car bomb (the largest the IRA had used in England at that point) outside a Selfridges store on Oxford Street injuring 9 people and causing over £1.5 million in damages. 21 December - The IRA exploded a fire bomb inside Harrods Department Store, one person was injured. 22 December The Provisional IRA announced a Christmas ceasefire. Prior to the ceasefire, they carried out a bomb attack on the home of former Prime Minister Edward Heath. Heath was not in the building at the time and no one was injured. 13 March - 1975 Conway's Bar attack A UVF member blew himself up along with a Catholic civilian woman while attempting to plant a bomb in a Belfast pub. 16 March Mildred Harrison (26), a Protestant, was the first RUC woman to be murdered on duty, killed by an explosion from a UVF bomb while on foot patrol passing Ormeau Arms Bar, High Street, Bangor, County Down. 5 April - Mountainview Tavern bombing 1975 A group calling itself the Republican Action Force bombed a pub in Belfast killing four Protestant civilians and a UDA member and injured 50 people. 12 April - Strand Bar bombing The Red Hand Commando (a UVF linked group) bombed a Belfast pub killing six Catholic civilians & injuring 50 others. 17 July Four British soldiers were killed by a Provisional IRA bomb near Forkhill, County Armagh. The attack was the first major breach of the February truce. 27 August - Caterham Arms pub bombing The IRA bombed a pub in Surrey injuring 33 people. 5 September Two killed and 63 injured when a bomb was detonated in the lobby of London's Hilton Hotel. 9 October - 1975 Piccadilly bombing The IRA bombed a tube station in London killing a civilian & injuring 20 others. 29 October - Trattoria Fiore bombing The IRA bombed a Mayfair restaurant injuring 18 people. 12 November - Scott's Oyster Bar bombing The IRA bombed a bar in London killing one civilian & injured 15 people. 18 November - Walton's Restaurant bombing The IRA bombed a restaurant in Knightsbridge, London killing two civilians and injured over 20. 29 November - 1975 Dublin Airport bombing The UDA bombed Dublin airport killing a civilian staff member & injuring 10 people. 19 December - Loyalists bombed a pub in Dundalk, County Louth in the Republic of Ireland which killed two civilians. The attack was linked to the Glenanne gang. 20 December - Biddy Mulligan's pub bombing The UDA bombed a popular Irish pub in London injuring five people. 31 December - 1975 Central Bar bombing Members of the Irish National Liberation Army (INLA) using the covername "Armagh People's Republican Army" bombed a pub in Portadown killing three Protestant civilians & injuring 30 people. 11 February Magherafelt police station blown up by 500lb bomb. Extensive damage but no deaths, minor injuries to service personnel and civilians living adjacent to the blast. 4 March - Cannon Street train bombing Eight people were injured when an IRA bomb exploded on a train. 7 March - Castleblayney bombing The UVF exploded a car bomb in County Monaghan killing a civilian & injuring 17 others. 17 March - Hillcrest Bar bombing The UVF exploded a car bomb outside a pub in Tyrone killing four people and injuring 50. 27 March - 1976 Olympia bombing An IRA bomb exploded in London killing one civilian and injuring 85 others in the blast. Due to the outrage over this bombing the IRA suspended attacks in England for a time period. 15 May Charlemont pub attacks Five Catholic civilians were killed and many injured by two Ulster Volunteer Force bomb attacks in Belfast and Charlemont, County Armagh. 21 July Christopher Ewart Biggs, the British Ambassador to Ireland, and his secretary Judith Cook, were killed in Dublin by a bomb planted in Biggs's car. 16 August - 1976 Step Inn pub bombing The UVF exploded in Keady South Armagh killing two civilians & injuring 20. 16 October - Garryhinch ambush The IRA exploded a bomb at a farmhouse in Garryhinch killing a member of the Garda Síochána & badly wounding four others. 17 February La Mon restaurant bombing – 12 civilians were killed and 30 injured by a Provisional IRA incendiary bomb at the La Mon Restaurant near Belfast. 21 September The Provisional IRA detonated bombs at the RAF airfield near Eglinton, County Londonderry. The terminal building, two aircraft hangars and four planes were destroyed. 22 March The Provisional IRA detonated 24 bombs in various locations across the Six Counties. 22 of the bombs were directed at banks. The biggest bomb was the 50 lb bomb at Dungannon bank that demolished the bank building and damaged all the buildings in the same street. 30 March Airey Neave, Conservative MP for Abingdon, was assassinated. A bomb exploded in his car as he left the Palace of Westminster in London. The Irish National Liberation Army (INLA) later claimed responsibility for the assassination. 17 April Four RUC officers were killed by a Provisional IRA van bomb in Bessbrook, County Armagh. The bomb was estimated at 1000 lb, the largest Provisional IRA bomb used up to that point. 27 August Warrenpoint ambush – 18 British soldiers were killed by a Provisional IRA bomb in Warrenpoint. A gun battle ensued between the Provisional IRA and the British Army, in which one civilian was killed. On the same day, four people (including the Queen's cousin Lord Louis Mountbatten) were killed by an IRA bomb on board a boat near the coast of County Sligo. 16 December Four British soldiers were killed by a Provisional IRA landmine near Dungannon, County Tyrone. Another British soldier was killed by a Provisional IRA landmine near Forkhill, County Armagh. 17 January Dunmurry train explosion – a Provisional IRA bomb prematurely detonated on a passenger train near Belfast, killing three and injuring five civilians. 7 March - an INLA Active service unit planted two 10 lb bombs at Netheravon British Army camp in Salisbury Plain. Only one bomb detonated & caused damage starting a fire, injuring two soldiers. 2 December 1980 - A device planted by the IRA exploded injuring five people at Kensington Regiment (Princess Louise's) Territorial Army Centre, Hammersmith Road, London. 8 January - The IRA planted a bomb in the Suvla barrack block at RAF Uxbridge. 35 RAF musicians and 15 RAF airmen living there were evacuated before it exploded. The building was damaged badly by the blast and debris thrown across the Hillingdon Road but no one was injured. 6 February Attacks on shipping in Lough Foyle (1981–82) - The IRA bombed and sank the British coal ship the Nellie M. An estimated £1 million was lost from the cargo. 27 April - The INLA killed RUC officer Gary Martin with a booby-trap bomb hidden in a lorry at the junction of Shaw's Road and Glen Road, Andersonstown, Belfast. 19 May Bessbrook landmine attack - The Provisional IRA South Armagh Brigade killed five British soldiers in a landmine attack at Bessbrook, Armagh. 10 October - Chelsea Barracks bombing - Two civilians are killed and over 20 British soldiers are injured in an IRA bombing outside Chelsea Barracks. 17 October - Lieutenant-general Sir Steuart Pringle was injured in an explosion at his home in Dulwich, London by a car bomb planted by the IRA. Sir Pringle lost a leg in the bombing. 26 October - The Provisional IRA bombed a Wimpy Bar on Oxford Street, killing Kenneth Howorth, the Metropolitan Police explosives officer attempting to defuse it. 23 November - The IRA detonated a bomb which exploded at the Royal Artillery Barracks HQ, Government House, Woolwich New Road, London SE18. Two people were injured in the blast. 24 November: the INLA claimed responsibility for exploding a bomb outside the British Consulate in Hamburg, West Germany. 25 November: the INLA claimed responsibility for exploding a bomb at a British Army base in Herford, West Germany; one British soldier was injured. 20 April The Provisional IRA detonated bombs in Belfast, Derry, Armagh, Ballymena, Bessbrook and Magherafelt. Two civilians were killed and 12 were injured. 12 May A INLA bomb explodes at the home of Assistant Chief Constable Sam Bradley. 30 June - The INLA planted a number of bombs around Derry injuring 17 people including, soldiers, police & civilians. 20 July Hyde Park and Regents Park bombings – 11 British soldiers and seven military horses died in Provisional IRA bomb attacks on Regent's Park and Hyde Park, London. Many spectators were badly injured. 16 September Divis Flats bombing 1982 - the INLA exploded a remote-control bomb hidden in a drainpipe as a British patrol passed Cullingtree Walk, Divis Flats, Belfast. Three people were killed a British soldier, Kevin Waller, and two Catholic children, Stephen Bennett and Kevin Valliday, and three others including two more British soldiers & a Catholic civilian were injured in the attack. 20 September - the INLA claimed responsibility for bombing a radar station on Mount Gabriel, County Cork. Five INLA volunteers hijacked a car carrying an engineer to the station. They forced their way inside, tied-up several workers and planted the bombs. The INLA claimed it attacked the station because it was linked to NATO. 18 October Robert Andrew Overend, the son of Robert Overend (a farmer, businessman and Unionist politician), was badly injured when an INLA bomb exploded under his vehicle on the family farm. 19 October: the INLA exploded a bomb at the headquarters of the Ulster Unionist Party (UUP) on Glengall Street, Belfast. The building was badly damaged by the blast. 6 December Droppin Well bombing – 11 British soldiers and six civilians were killed by an Irish National Liberation Army (INLA) bomb at the Droppin’ Well Bar, County Londonderry. 10 December - 1983 Royal Artillery Barracks bombing On 10 December 1983 a bomb exploded at the Royal Artillery Barracks in Woolwich, South East London. The explosion injured five people and caused minor damage to the building. The IRA claimed they carried out the attack. 13 July Four Ulster Defence Regiment (UDR) soldiers were killed by an IRA landmine in County Tyrone. 4 November - An INLA van bomb explodes outside the Fair bar on Patrick street, Strabane. The explosion demolished the bar injuring 29 people, seriously injured 13 people (including 3 RUC officers) and another 16 people had minor injuries that did not require hospital attention. 17 December Harrods bombing – a Provisional IRA car bomb killed three policemen and three civilians and injured ninety outside a department store in London. 9 May A territorial Army reserve soldier died when the IRA booby-trapped their car. Two others in the car were seriously injured in the explosion. 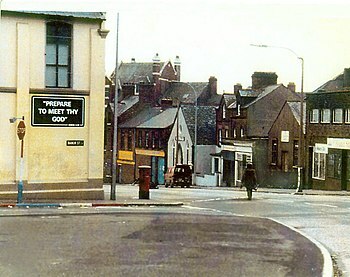 Belfast Road, Newry. 18 May Three British soldiers were killed by a Provisional IRA landmine in Enniskillen, County Fermanagh. Two RUC officers were killed by a Provisional IRA landmine near Camlough, County Armagh. 12 October Brighton hotel bombing – the Provisional IRA carried out a bomb attack on the Grand Hotel, Brighton, which was being used as a base for the Conservative Party Conference. Five people, including MP Sir Anthony Berry, were killed. Margaret and Denis Thatcher were at the scene but unharmed. 28 February - Newry mortar attack – a Provisional IRA mortar attack on the Newry RUC station killed nine officers and injured thirty-seven. 27 February: An INLA bomb destroyed a petrol station near Windsor Park. Earlier in the day the English football team played a match against Northern Ireland in the stadium and an INLA statement warned there would be further attacks on sporting events in the Province. 3 April - The IRA exploded a car bomb outside Newry Courthouse, killing a RUC officer & a civilian. 20 April: The INLA claimed responsibility for firebombing a store in Dublin which was selling South African goods in protest against the apartheid regime. There were no injuries as the building had been cleared following a telephone warning. 20 May Killeen Landmine attack Four Royal Ulster Constabulary officers were killed by a Provisional IRA bomb near Killeen, County Armagh. 9 August: A train travelling from Belfast to Dublin was severely damaged after the INLA planted 4 bombs in the carriages. 29 August: The INLA exploded a bomb on a train outside the Belfast central railway station injuring seven RUC officers & two members of the train stations staff and badly damaging a number of carriages. 4 September The RUC training centre & barracks was hit by three mortar shells fired from a truck by the Provisional IRA. 30 people (10 civilian) were injured in the attack and the building was badly damaged. 7 December Attack on Ballygawley barracks – the Provisional IRA launched an assault on the RUC barracks in Ballygawley, County Tyrone. Two RUC officers were killed and the barracks was completely destroyed by the subsequent bomb explosion. 11 December: the IRA East Tyrone Brigade claimed responsibility for mortaring Tynan RUC base, County Armagh in which four RUC officers were injured. 1 January - The IRA's South Armagh Brigade killed two RUC officers on foot patrol when a bin exploded when the foot patrol passed it, the IRA detonated the bomb by remote. 11 August - Attack on RUC Birches barracks The Provisional IRA's East Tyrone Brigade destroyed the RUC barracks at The Birches with a 200lb bomb driven in a JCB digger, near Portadown. 28 August: The INLA claimed responsibility for bomb attacks across Northern Ireland: two car bombs exploded outside RUC bases in Newry and Downpatrick, a third bomb exploded in a disused factory in Derry city and a fourth was found under an RUC officer's car in Antrim. 29 August: The INLA exploded a small bomb in the centre of Antrim. 30 August: The INLA explode a bomb at a pub in Antrim. 7 November 1986 – Two bombs planted by the UFF exploded in garbage cans on Dublin's main street but caused no deaths or injuries, and two others were found and defused. The following day a UFF spokesman said the UFF had "the potential to cause death & destruction" & that "the warning should not go on unheeded". 11 November 1986 - Eleven hoax bomb warnings at various businesses in Dublin's Grafton Street and Dawson Street caused large disruption in Dublin city. The UFF is believed to be behind the hoaxes. 8 November Remembrance Day bombing – 11 civilians were killed and sixty-three injured by a Provisional IRA bomb during a Remembrance Day service in Enniskillen, County Fermanagh. One of those killed was Marie Wilson. In an emotional BBC interview, her father Gordon Wilson (who was injured in the attack) expressed forgiveness towards his daughter's killer, and asked Loyalists not to seek revenge. He became a leading peace campaigner and was later elected to the Irish Senate. He died in 1995. 7 & 8 February 1987 – The UFF exploded incendiary devices in Co. Donegal(including attacks on premises in Ballybofey, Letterkenny and Castlefin) and in Dublin. No injuries. It was alleged that these attacks had been approved by UFF leader John McMichael who was planning a large bombing campaign in the Republic of Ireland, but McMichael was killed a few months later by the Provisional IRA. 15 August - A number of IRA letter bombs were sent to six senior civil servants around London. No injuries. 15 June Six off-duty British soldiers were killed by a Provisional IRA bomb on their minibus in Lisburn. 1 August - the Inglis Barracks bombing - A British soldier was killed and another nine injured when the IRA exploded a time bomb outside Inglis Barracks in Mill Hill, London. 20 August Ballygawley bus bombing – eight British soldiers were killed and 28 wounded by a Provisional IRA roadside bomb near Ballygawley, County Tyrone. 20 February Clive Barracks bombing - The Clive barracks bombing was a bomb attack carried out by the IRA at Clive Barracks, Ternhill, Shropshire, England. Only 2 people were injured in the attack but a good deal of structural damages was done. 22 September Deal barracks bombing – 11 Royal Marines bandsmen were killed by the Provisional IRA at Deal Barracks in Kent, England. 18 November - A IRA bomb attached to a car exploded outside Married Quarters, Colchester. Two people were injured. 9 April Four UDR soldiers were killed when the Provisional IRA detonated a culvert bomb under their patrol vehicle in Downpatrick, County Down. The bomb contained over 1,000 lb (450 kg) of explosive and was so powerful that the vehicle was blown into a nearby field. 25 June Carlton Club bombing a bomb exploded at the Carlton Club in London, injuring 20 people. Lord Kaberry died of his injuries on 13 March 1991. 20 July The Provisional IRA bombed the London Stock Exchange. 30 July Conservative MP Ian Gow was killed by a car bomb outside his house near Eastbourne. 6 September The Provisional IRA planted two bombs aboard the Royal Fleet Auxiliary replenishment ship RFA Fort Victoria. One of them exploded, disabling the ship which had been constructed in Belfast and launched some weeks before. The second bomb failed to go off and was found and defused 15 days later. 24 October Proxy bomb attacks – the Provisional IRA launched three "proxy bombs" or "human bombs" at British Army checkpoints. Three men (who were working with the British Army) were tied into cars loaded with explosives and ordered to drive to each checkpoint. Each bomb was detonated by remote control. The first exploded at a checkpoint in Coshquin, killing the driver and five soldiers. The second exploded at a checkpoint in Killean; the driver narrowly escaped but one soldier was killed. The third failed to detonate. 3 February The Provisional IRA launched a 'proxy bomb' attack on an Ulster Defence Regiment base in Magherafelt, County Londonderry. The bomb caused major damage to the base and nearby houses, but the driver escaped before it exploded. 7 February Downing Street mortar attack- The Provisional IRA launched a Mortar attack on Ten Downing Street during a cabinet meeting with one mortar shell exploding in the garden, causing minor injuries to two people and two further shells landing nearby. 18 February A Provisional IRA bomb detonated in a litter bin at Victoria Station, London, killing David Corner, and injuring 38. An earlier bomb at Paddington Station caused no casualties. These bombs led to the removal of all litter bins on station platforms. 31 May Glenanne barracks bombing – the Provisional IRA launched a large truck bomb attack on a UDR barracks in County Armagh. Three soldiers were killed, whilst ten soldiers and four civilians were wounded. 1 June 1991 - The IRA explode a large 600 lb car bomb in the Loyalist village of Donaghcloney, wrecking a number homes four of which were completely destroyed, but causing no death or serious injury to the occupants.. The village was home to former Glenanne Gang member & UVF leader Robin Jackson who killed dozens of people & carried out some of the worst sectarian massacres of the 1970s. 27 - 28 July 1991 - UFF exploded seven incendiary devices in a number of shops in the Republic of Ireland. No injuries. 2 November Two British soldiers were killed when the IRA detonated a bomb at Musgrave Park British Army hospital in Belfast. A two-storey building was destroyed by the blast. 15 November A provisional IRA bomb detonated in St Albans City Centre. Two fatalities, both members of the provisional IRA (Patricia Black and Frankie Ryan), were the only casualties. 14/15 December Three firebombs exploded at the Brent Cross Shopping Centre in north-west London on Saturday 14th and another in the National Gallery on Sunday 15th. 16 December A trackside bomb near to Clapham Junction railway station in south London, followed by hoax telephone warnings, disrupted travel in the city. 17 January Teebane bombing – A 600-pound (270 kg) (1,500-pound (680 kg) per another source) roadside bomb detonated by the Provisional IRA destroyed a van and killed eight construction workers (one of them a soldier) on their way back from Lisanelly British Army barracks in Omagh, County Tyrone, where they were making repairs. Another eight were wounded. 10 April Baltic Exchange bombing – a van loaded with one-ton of home-made explosives went off outside the building of the Baltic Exchange company, at 30 St Mary Axe, London, killing three people and injuring other 91. The Provisional IRA bomb caused £800 million worth of damage, £200 million more than the total damage caused by the 10,000 explosions that had occurred during the Troubles in Northern Ireland up to that point. Three hours later, a similar sized bomb exploded at the junction of the M1 and the North Circular Road at Staples Corner in north London, causing much damage but no injuries. Both bombs were placed in vans and were home-made rather than Semtex; each weighed several hundred pounds. 1 May Attack on Cloghogue checkpoint - the Provisional IRA, using a van modified to run on railway tracks, launched an unconventional bomb attack on a British Army checkpoint in South Armagh. The checkpoint was obliterated when the 1,000 kg bomb exploded, killing one soldier and injuring 23. 12 May Coalisland riots – After a small Provisional IRA bomb attack in the village of Cappagh, in which a paratrooper lost both legs, British soldiers raided two public houses and caused considerable damage in the nearby town of Coalisland. This led five days later to a fist-fight between soldiers and local inhabitants. Shortly thereafter, another group of British paratroopers arrived and fired on a crowd of civilians, injuring seven. Two soldiers were hospitalized. 18 June 1992 Leeds Bombing The INLA planted nine devices in Leeds city centre, only four of the devices managed to explode the rest either were found & defused or failed to go off. Still £50,000 of damage was done from the four devices that went off. 19 September Forensic Science Laboratory bombing - The Provisional IRA detonated a 3,700 lb bomb at the Northern Ireland forensic science laboratory in south Belfast. The laboratory was obliterated, 700 houses were damaged, and 20 people were injured. 490 owners and occupiers claimed for damages. 13 October - the Provisional Irish Republican Army detonate a bomb at lunchtime in The Sussex Pub in Long Acre, Covent Garden, London. 5 people are seriously injured. 21 October The IRA detonated a 200-pound (91 kg) bomb, causing large amounts of damage to nearby buildings, in Main Street, Bangor, County Down. 13 November The IRA detonated a large van bomb in Coleraine town centre. Extensive property damage was caused, resulting in several major buildings being demolished, but no one was killed. The Coleraine Town Hall required major structural work, and was not reopened until August 1995. 3 December Manchester Car bomb behind Kendalls. Later that morning, after other threats of other bombs including the Arndale Centre, a bomb was detonated on Cateaton Street. 59 were injured, one seriously. 10 December 1992 - The UFF carried out seven firebomb attacks on shops in Dublin, Moville and Buncrana in the Republic of Ireland. 4 February Two IRA bombs exploded in the London area, one at South Kensington Underground station and another on a Network Southeast train at Kent House station in Beckenham. Bank and Monument stations in the City of London were also closed by telephoned bomb warnings. 7 March The IRA detonated a 500-pound (230 kg) car bomb in Main Street, Bangor, County Down. Four Royal Ulster Constabulary (RUC) officers were injured in the explosion; the cost of the damage was later estimated at £2 million, as there was extensive damage to retail premises and Trinity Presbyterian Church, as well as minor damage to the local Church of Ireland Parish Church and First Bangor Presbyterian Church. 20 March Warrington bomb attacks – after a telephoned warning, the Provisional IRA detonated two bombs in Cheshire, England. Two children were killed and 56 people were wounded. There were widespread protests in Britain and the Republic of Ireland following the deaths. 24 April Bishopsgate bombing – after a telephoned warning, the Provisional IRA detonated a large bomb at Bishopsgate, London. It killed one civilian, wounded 30 others, and caused an estimated £350 million in damage. 6 July A large IRA bomb caused widespread damage to the centre of Newtownards, Co Down. The centre of the market town was devastated by a bomb which the IRA said contained 1,500 lbs of explosive. Seven people were injured, one seriously. 23 October Shankill Road bombing – nine civilians, and one Provisional IRA member were killed and another Provisional IRA member injured whenIRA bomb prematurely exploded at a fish shop on Shankill Road, Belfast. 24 October Bombs exploded at Reading railway station (trackside and in a station toilet). A bomb was discovered at Basingstoke railway station and there were telephoned warnings of other devices planted at Waterloo and Guildford railway station. The rail network was extensively disrupted. 5 January 1994 – Two members of the Irish Army bomb disposal unit are injured when a parcel bomb sent by the UVF to the Sinn Féin offices in Dublin exploded during examination at Cathal Brugha barracks. 24 January 1994 - Incendiary devices that had been planted by the UFF, were found at a school in Dundalk in County Louth and at a postal sorting office in Dublin. 9 - 13 March 1994 Heathrow mortar attacks - On the 9, 11 & 13 March the IRA fired mortars on to the runway at Heathrow Airport. There was no deaths or injuries. 20 April 1994 - The Provisional IRA Derry Brigade fired a mortar bomb at a RUC landrover, killing one RUC officer & injuring two others. 29 July - More than 40 people were injured when the Provisional IRA fired three mortar bombs into Newry RUC base. 30 civilians, seven RUC officers and three British soldiers were among those injured who were treated at Daisy Hill Hospital in Newry. 12 September 1994 1994 Dublin-Belfast train bombing - The UVF plantd a bomb on the Belfast-Dublin train. At Connolly station in Dublin the bomb only partially exploded slightly injuring two women. 9 February London Docklands bombing – the Provisional IRA bombed the Docklands in London. The bomb killed two civilians, and brought to an end the ceasefire[which?] after 17 months and nine days. 18 February Aldwych Bus Bomb – Edward O'Brien, a Provisional Irish Republican Army (IRA) volunteer, died on 18 February 1996 when an improvised explosive device he was carrying detonated prematurely on a number 171 bus in Aldwych, in central London. The 2 kg semtex bomb detonated as he stood near the door of the bus. A pathologist found O'Brien was killed "virtually instantaneously", while other passengers and the driver (left permanently deaf) were injured in the explosion. 15 June Manchester bombing – the Provisional IRA detonated a bomb in Manchester, England. It destroyed a large part of the city centre and injured over 200 people. To date, it is the largest bomb to be planted on the British mainland since World War II. The devastation was so great, that several buildings were damaged beyond repair, and had to be demolished. 7 October The Provisional IRA detonated two car bombs at the British Army HQ in Thiepval Barracks, Lisburn. One soldier was killed and 31 injured. 26 March Two trackside bombs exploded at Wilmslow railway station in Cheshire. Similar bomb warnings at Doncaster, South Yorkshire, closed the East Coast main line for some time. 16 September Markethill bombing - the dissident Continuity IRA (CIRA) planted a 400-lb van bomb in the village of Markethill, County Armagh, just outside the local RUC station, causing widespread damage but a few injures. The bombing happened a day after Sinn Féin joined the political negotiations which led to the Good Friday Agreement. 24 June Newtownhamilton bombing - The Irish National Liberation Army explode a 200 lb car bomb in the south Armagh village of Newtownhamilton, injuring six people and causing large damage estimated at £2 million. 1 August 1998 Banbridge bombing - a dissident republican group calling itself the Real IRA detonated a bomb in Banbridge, County Down, injuring 35 people and causing extensive damage. 15 July 1998 - A package addressed to a Dublin hotel, which was believed to have been sent by the LVF, exploded while it was being examined at the Garda Technical Bureau in Dublin. Two were injured in the blast. 15 August Omagh bombing – the Real IRA detonated a bomb in Omagh, County Tyrone. It killed 29 civilians, making it the worst single bombing of the Troubles, in terms of civilian life lost. 15 March Solicitor Rosemary Nelson, who had represented the Catholic and nationalist residents in the Drumcree dispute, was assassinated by a booby trapped car bomb in Lurgan, County Armagh. A loyalist group, Red Hand Defenders, claimed responsibility. 4 March BBC bombing – a Real IRA bomb exploded outside BBC Television Centre, causing some damage to the building. 3 August Ealing bombing – a Real IRA car bomb injured seven civilians in Ealing, west London. 5 September A pipe bomb exploded on Ardoyne Road in North Belfast, injuring a policeman. ^ "CAIN: Northern Ireland Society – Security and Defence". Retrieved 30 January 2015. ^ "Bomb Damages RTÉ TV Studios". RTÉ Archives. ^ Melaugh, Dr Martin. "CAIN: Chronology of the Conflict 1969". cain.ulst.ac.uk. ^ Sutton, Malcolm. "CAIN: Sutton Index of Deaths". cain.ulst.ac.uk. ^ "February - 2014 - Come Here To Me!". comeheretome.com. ^ Melaugh, Dr Martin. "CAIN: Chronology of the Conflict 1970". cain.ulst.ac.uk. ^ "Provisional IRA bomb Northern Bank branch in High Street Belfast N Ireland July 1970 - Victor Patterson". victorpatterson.photoshelter.com. ^ "CAIN: Sutton Index of Deaths". cain.ulster.ac.uk. ^ Daly, Susan. "Bombed staircase in O'Connell Tower at Glasnevin to be rebuilt". thejournal.ie. ^ Melaugh, Dr Martin. "CAIN: Chronology of the Conflict 1971". cain.ulst.ac.uk. ^ "February 8th, 1971". irishtimes.com. ^ "CAIN: Chronology of the Conflict 1971". cain.ulster.ac.uk. ^ "The Troubles 7". Issuu. ^ Joe Graham, Rushlight Magazine. "McGurk's Bar Massacre". Retrieved 30 January 2015. ^ "1972: IRA bomb kills six at Aldershot barracks". BBC News. 22 February 1972. ^ "Bloody Friday: What happened". BBC News. 16 July 2002. ^ "Claudy bombing: Should there be an inquiry?". BBC News. 23 December 2002. ^ "1974: Soldiers and children killed in coach bombing". BBC News. 4 February 1974. ^ "CAIN: Chronology of the Conflict 1974". cain.ulster.ac.uk. ^ "1974: Bombs devastate Dublin and Monaghan". BBC News. 17 May 1974. ^ "1974: Four dead in Guildford bomb blasts". BBC News. 5 October 1974. ^ "1974: Birmingham pub blasts remembered". BBC News. 21 November 1974. ^ Toolis, Kevin (25 February 1990). "When British Justice Failed" – via NYTimes.com. ^ "1974: Heath's home is bombed". BBC News. 22 December 1974. ^ "Memorial for ambassador". BBC News. 22 July 2001. ^ "1979: Car bomb kills Airey Neave". BBC News. 30 March 1979. ^ "1979: Soldiers die in Warrenpoint massacre". BBC News. 27 August 1979. ^ "1979: IRA bomb kills Lord Mountbatten". BBC News. 27 August 1979. ^ "PREVENTION OF TERRORISM (TEMPORARY PROVISIONS) ACT 1976 (CONTINUANCE) ORDER 1980 (Hansard, 17 March 1980)". api.parliament.uk. Retrieved 2019-01-27. ^ "CAIN: Chronology of the Conflict 1981". cain.ulster.ac.uk. Retrieved 2019-01-27. ^ "Prevention of Terrorism Legislation (Hansard, 4 March 1993)". api.parliament.uk. Retrieved 2019-01-27. ^ a b The Bulletin. 26 November 1981. ^ "1982: IRA bombs cause carnage in London". BBC News. 20 July 1982. ^ "1984: Tory Cabinet in Brighton bomb blast". BBC News. 12 October 1984. ^ "EDINA NewsFilm Online Service Decommissioned". Retrieved 30 January 2015. ^ "Northern Ireland: Bomb Outside Soccer Ground". Itnsource.com. 2016-09-28. Retrieved 2016-10-05. ^ INLA claims responsibility for firebombing Dublin store selling South African goods Archived 2012-04-05 at the Wayback Machine, foia.cia.gov; accessed 3 November 2015. ^ "Ulster Train Bomb". Itnsource.com. Retrieved 19 October 2016. ^ Robert W White - Out Of The Ashes: An Oral History On Provisional Irish Republican Movement p.244,245. ^ "Ulster is rocked by bomb blitz". Evening Times. 28 August 1986. ^ "Bomb Hoaxes in Dublin". rte.ie. ^ "1987: Bomb kills 11 at Enniskillen". BBC News. 8 November 1987. ^ Melaugh, Dr Martin. "CAIN: Chronology of the Conflict 1987". cain.ulst.ac.uk. ^ "1989: Ten dead in Kent barracks bomb". BBC News. 22 September 1989. ^ "A Chronology of the Conflict −1990". CAIN. ^ "Colombia - Encyclopedia.com". www.encyclopedia.com. ^ Schmidt, William E. (20 February 1991). "I.R.A. Bombs And Motives". The New York Times. ^ "Wreath laid in memory of IRA St Albans bomber". BBC News. ^ a b "IRA rail bomb causes chaos for commuters". The Herald. Scotland. 17 December 1991. ^ De Baróid, Ciarán (2000). Ballymurphy And The Irish War. Pluto Press. p. 325. ISBN 0-7453-1509-7. ^ "IRA City bombers identified by police". The Independent. 15 July 1992. ^ "IRA blast damages over 1,000 homes". The Independent. London. 24 September 1992. ^ http://cain.ulst.ac.uk/heathwood/static/1992.html - Loyalist UFF has admitted fire bombs attacks in Donegal and Dublin. Film report on Buncrana and Moville damage, Garda comments, UFF refers to Dublin interference in Northern Ireland, H.Annesley (RUC Chief) comments. ^ Bennett, Will (4 February 1993). "IRA bombs train and Tube station: Two explosions bring disruption to the transport network in London as terrorists introduce new tactic". The Independent. London. ^ "Warrington remembers IRA bombing victims". BBC News. 14 March 1998. ^ "1993: IRA bomb devastates City of London". BBC News. 24 April 1993. ^ "Town blasted by 1,500lb IRA bomb". The Independent. London. 6 July 1993. ^ "IRA bomb strike paralyses main railway network Setback for peace talks after weekend of terrorist outrage". The Herald. Scotland. 25 October 1993. ^ "Two injured by loyalist shoebox bomb on train: Serious casualties". independent.co.uk. 13 September 1994. ^ Melaugh, Dr Martin. "CAIN: Chronology of the Conflict 1994". cain.ulst.ac.uk. ^ "1996: Docklands bomb ends IRA ceasefire". BBC News. 10 February 1996. ^ "Bomb blast destroys London bus". BBC News. 18 February 1996. Retrieved 2007-06-13. ^ English, Richard (2003). Armed Struggle: The History of the IRA. Pan Books. p. 291. ISBN 0-330-49388-4. ^ Bennetto, J. Dead IRA man 'had hit-list' of bomb targets. The Independent, 17 April 1996. ^ "1996: Huge explosion rocks central Manchester". BBC News. 15 June 1996. ^ Jury, Louise (27 March 1997). "IRA back in fray with trackside explosions". The Independent. London. ^ "A Chronology of the Conflict – 1997". CAIN. Retrieved 2013-07-15. ^ "Incident Summary for GTDID: 199807150003". Retrieved 30 January 2015. ^ "Inquiry into Nelson murder opens". BBC News. 19 April 2005. ^ "BBC bomb prompts terror warning". BBC News. 5 March 2001. ^ "Ealing bombers 'will be caught'". BBC News. 5 August 2001. ^ Taylor, Alan. "9/11: The Week Before". The Atlantic. Retrieved 2018-09-19.